13-15 year olds will need a Teen Ticket. Children 12 and under accompanied by an adult (max 5 children per responsible adult) are admitted to the circuit and paddock (providing the responsible adult is still accompanying them) free of charge. Children 15 and under accompanied by an adult (max 5 children per responsible adult) are admitted to the circuit and paddock (providing the responsible adult is still accompanying them) free of charge. 2018 Croft Season Passes on sale now! With the likes of the Dunlop MSA British Touring Car Championship, Croft Nostalgia Festival and much more taking place at Croft in 2018, a season pass is perfect to make sure you don't miss any of the action and they are now on sale. 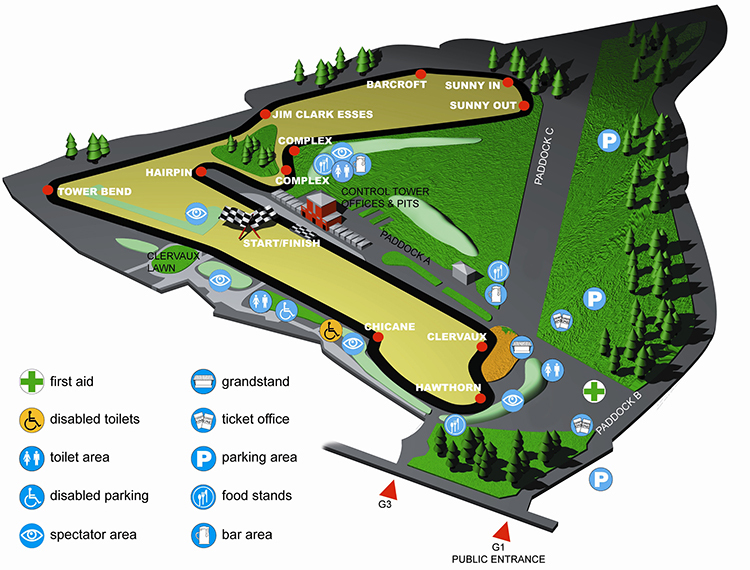 Croft circuit is one of the most challenging tracks in the UK. It is also one of the longest at 2.1 miles / 3.36 km per lap. There is no public camping facilities at Croft Circuit. We can have competitors staying overnight on site. All tickets are posted via royal mail second class unless you have requested special delivery. If you have ordered your tickets and you are concerned that you have not received them please call the ticket office on 01325 721815, and we will try to help trace your order. All tickets are sent nearer the meeting, usually 7-10 days before to ensure you receive them in time. If you're tickets have not been delivered, please contact us as soon as you can on 01325 721815. What if my tickets don't arrive in time? In the rare event that your tickets have not arrived in time you will need to purchase them at the gate, we will then refund you after the event. All you need to do is return the on the day ticket and your original advance tickets to the ticket office to claim your refund. Can I collect my tickets on arrival at the circuit? Normally all tickets are sent via post, however if you have been notified that your tickets are only available to collect, or have made prior arrangements for collection, then your tickets will be left at the ticket gate in use for the event. The Event Stewards on the day will direct you to the ticket gate. Is the grandstand included in my ticket? For club race meetings grandstand seating is included in the price of the admission ticket on a first come, first served basis. 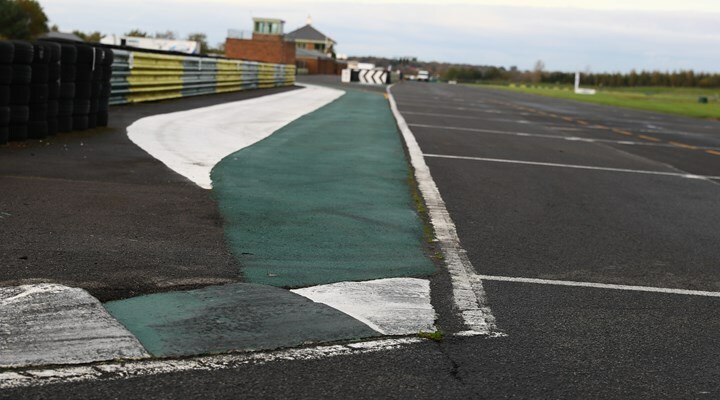 For the British Touring Car Championship meeting, grandstand seats must be purchased for an adult and for children separately in advance and are subject to availability. Is camping available at the circuit? Unfortunately we are only able to offer camping to competitors. For club meetings children aged 15 and under are admitted free of charge. For the British Touring Car Championship meeting a teen ticket, children aged 13 - 15, must be purchased. Please see the individual ticket prices for each event for full details of concessions available. Opening times vary according to the meeting. At most club race meetings the gates open at 08:30 on Saturday and 10:30 on Sunday, but be sure to check the information page for each event to confirm. The last race/event will finished no later than 6.30pm. Where is the disabled viewing area? We have a parking area for Blue Badge holders close to the spectator banking alongside the straight after Hawthorn. If you have lost any of your property please report it as soon as you can to reception in the main office building. In the event that a child is found to be lost within the circuit, they will be taken to reception in the main office building where CRB checked staff will care for them until they are reunited with their parent/guardian. Where is the first aid/medical centre? The medical centre is next to the grandstand and there is a mobile first aid team present at each race meeting. If you have a medical emergency please inform the nearest member of staff who will summon assistance. As much as we love our pets, Croft is an active race circuit and as such we have a strict no animals policy on site. We reserve the right to use any means possible to free any distressed animal found to be locked in a vehicle anywhere on the site including in the car parks, and give them into the care of an animal charity. There are baby changing facilities situated in the new toilet block in the paddock, or inside the main office building.